Are you a person who loves the company of a friend or a partner when venturing the waters? Well, if you are one of them, this article will give you an idea of the best 2 person kayak, or tandem kayak for a great paddling experience. Kayaking with a friend or partner will offer you better opportunity to socialize. This is a great way to sharing your water paddling experience together and at the same time, enjoying it. Continue reading on to find which tandem kayak is best for you. For those who wants to jump straight to the conclusion, here are our top picks. Can hold up to 650 lbs, hence may fit up to 3 people. Weight capacity limit of 500 lbs. Generally, tandem kayaks are bigger in size than the solo kayaks. They are exclusively designed to fit two paddling enthusiasts. If you are a couple or siblings who love to paddle, then owning a solid tandem kayak is surely a good option. However, be aware that, different type of kayak is meant to be used for different water condition. So, read along our article to find out what are the differences between each kayak and what to consider before buying your own kayak. What Is Good About Tandem Kayak? The following are the list of our top 5 2-person kayaks to suit your paddling needs and goals. 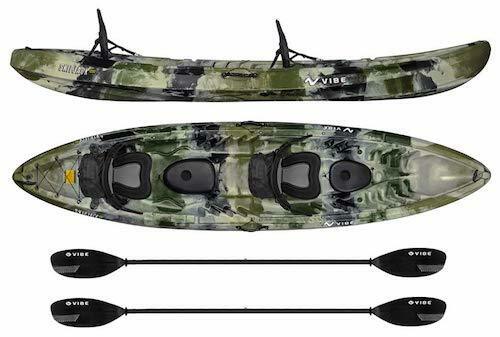 If you are interested in kayak fishing, then there are no better fishing kayaks than the Vibe Kayaks Skipjack 120T. It is a very stable and nice tandem kayak to be used on lakes and ponds. This is a very good kayak to introduce anyone to kayak fishing or kayaking. It is very easy to paddle and comes with three seating positions, 2 adults and a child seat. A solo person can also paddle the boat from the center. 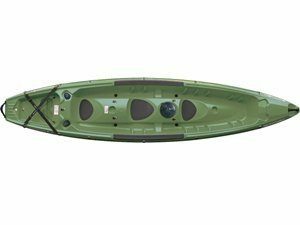 These kayak fishing boats have ample cargo space offered by two sealed hatches. 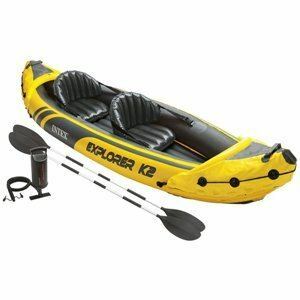 If you are looking for an affordable, lightweight, portable and stable inflatable 2 person fishing kayak, then the Sea Eagle SE370K is the ideal one for you. Do not get fooled by its size. It is a rugged and highly durable kayak that can hold up to 3 persons. The max load it can take is about 650 pounds. It is best suited for two people. This kayak weighs just 32 pounds and hence can be easily stored in your small car’s trunk. The seats can be placed on the kayak, depending on the number of people paddling the boat. This feature gives you the option to carry more gear on your fishing trips. It is the best kayak to handle whitewater. This kayak offers decent legroom space for tandem kayakers. It is made of tougher materials and hence you do not have to worry about sharp rocks in the water. This inflatable kayak is the best to use on lakes and mild rivers. It is very easy to assemble and can be carried comfortably in a bag for your water excursion trips. 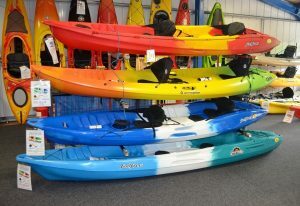 These youth kayaks are made using high quality and durable vinyl and have I-beam floors. A detachable skeg is provided on the floor of the kayak for greater directional stability. The Boston valve helps in very easy deflating or inflating the boat. If comfort, larger cargo space, partner kayaking and leisure paddling are what you are looking for, you have check out the BIC Sport Borneo Kayak for your fishing and paddling excursions. This is a 100% convertible best sit on top tandem kayak that offers great paddling comfort for solo or tandem kayakers. It has a unique and streamlined shape to offer great stability on the waters. The large rear section makes sure that you get enough storage space to keep your gear. The product is full of innovation and one such innovation is the rollers or wheels under the boat for smooth and easy transportation. The wheels can be stored in the molded deck insert when the boat on the water. The Ocean Kayak Malibu is a compact, versatile, stable and a perfect tandem kayak for everyone interested in paddling. 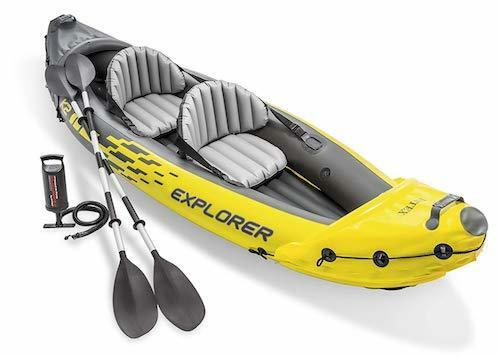 This kayak can be used as a solo or a double kayak. It also has space large enough to fit a pet or a child. The design of this kayak is in a multi-hull shape with hard and rigid shell. Lastly, it has back support molded seats and also comes with foot wells in the center. 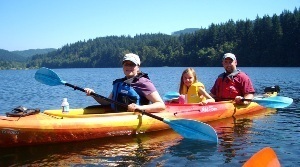 This sit on top kayak is great for recreational paddlers and offers great family fun. This kayak is very easy to paddle even for newcomers to paddling. It can be used on rivers, lakes, canals, inland waterways, etc. The yaks or the kayaks are small water boats or crafts designed for one, two or a small family. They need to be moved on the water using a double paddle with the blade on both the ends. These Kayaks come with 2 basic cockpit designs: sit inside Kayak and sit on top Kayak. The paddlers are seated within the Kayak in the seat inside Kayak. The sit on top Kayak will not be enclosed and hence getting in and out of the Kayak is very easy. There is a wide range of Kayaks on sale these days. They are classified depending on the user levels and also the activities. You can buy Kayaks for general water tour, water recreation, fishing, family water trip, etc. You can buy leisure Kayaks to enjoy smooth paddling on the waters. These inflatable kayaks are all the best for anyone looking to get into the water without needing to worry about Kayak transportation. These Kayaks can be inflated by filling in the air and can be easily deflated. They can be reduced in size in such a way that they can fit inside your backpack. You do not need to invest in trailers or a roof rack to carry the boat to the waters. The 2 person inflatable fishing kayak takes about 10 minutes to get inflated. These boats cost very less when compared to plastic or hard-shell kayaks. They are ideal for first-time Kayak users who hit the waters occasionally. These are the Kayaks that are in great demand for the past few years. A good fishing Kayak will have the storage hatches and rod holders in perfect position for fishing. The life vest that needs to be kept at arms distance and hence it will be located the front of the seat. The professional fishing kayakers need a big storage area to keep their catch cool. Choosing kayaks with comfortable adjusting seats is ideal. Using seats with lumbar support is a must for people venturing into longtime fishing. Sharing water adventure trips is fun and exciting. This can come true if you venture into the lakes and the rivers or ponds with a tandem Kayak. By using a two person fishing kayak, you can share the paddling with your partner. This means both of you need to put in less effort to move the boat and enjoy each other’s company. They are little heavier than the solo craft. The best part about the tandem kayaks is that they can fit a smaller third person like a child or your pet. This makes it a great boat for socializing. These kayaks are also in great demand as everyone loves a water excursion or a recreation. These are the perfect boats to use on slow rivers, calm seas and flatter waters. They are designed for paddlers who love to paddle away from the shore or to enjoy the swim in the middle of the water. This 2 person fishing kayak is not for kayakers looking for greater speed. They are versatile and choosing sturdy and well-built ones will serve your recreational purposes for a long time. The inflatable kayaks are the best when it comes to water recreation. They are very easy to fold and carry around in small bags. Buying a solid tandem kayak is the best option for paddlers who like to have fun in a safe way. Selecting a right double kayak can make your expedition enjoyable. You will be able to share the joy of the kayaking experience when you have company. 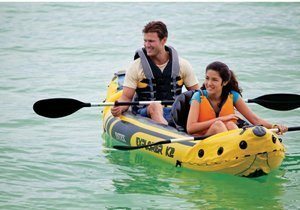 When you want to take a family member or friend along with you to the waters double kayaks are the best choice. You can rent or purchase the kayak of your choice from rental services in your area. Here are some of the advantages of using tandem kayaks. Paddling doubles is easy and enjoyable compared to single kayak. In touring double kayak there is center hatch with seat or for gear. This gives paddlers enough room to paddle at a different pace. Double kayaks are wider than single kayaks and hence offer better stability and speed. This type is highly suitable for novice paddlers and rough waters. When you are paddling with a partner, you learn to work as a team. This is will help you to enjoy each other’s company better. Buying two separate single kayaks are costlier than buying a single tandem kayak. You can this for tandem or solo paddling. Any novice can go for paddling with an expert paddler in tandem. When two are there it is easy to get some assistance during emergency. Family paddling can be made easy and safe with double kayak. Double kayaks have space to fit parents and one or two children. You can also take your pet dog for kayaking when you opt for double kayaks. This type of kayak comes with designs which allow you to carry the items needed for a camping trip or for expeditions. You can look for a tandem kayak for sale from online sites to purchase the ideal boat. There are many choices available when you look to purchase tandem kayak for your paddling needs. There are kayaks with specialized designs for specific applications. The right kayak for each person depends on water types, the number and weight of people and purpose. To find the right kayak for your needs you need to consider certain facts. Here are the factors and ideas to consider when you are trying to purchase the kayak. Kayaking in lake, river, or seacoast has different requirements and deciding on the location for kayaking will help in understanding your choice. You also need to consider how long you will be traveling on your boat. Consider do you need to carry camping gear in your boat and how skilled you are into kayaking before finalizing on the boat. 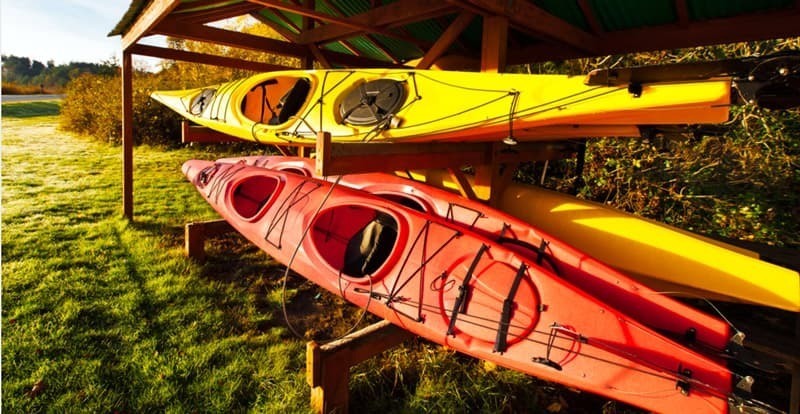 There are double kayaks for general recreation purpose which can be used in slow-moving waters. Kayaks for touring and cruising purposes come with storage space to hold various gears. Fishing kayaks come with fish finder and bait wells, rod holders, etc. If you are a female, then this article will greatly help you in your search for a kayak. You need to know whether you need a sit-inside kayak or sit-on-top kayak. If you are kayaking in warm weather sit –on–top kayaks are the ideal choice. It is easy to flip over with sit-on-top type. This type is heavier, wider and slow in speed than the sit-in-type. If you are paddling in colder waters using sit-inside kayak boats are the right choice. This type offers protection to lower body and offers better stability. This type is more suitable for rough conditions. If you need to carry around your kayak, select kayaks made of lighter material. This will help in easy transportation. Though lightweight kayaks are costly, they offer weight carrying capacity and better speed. You can select from polyethylene, ABS plastic or composite material. Polyethylene kayaks are heavy and are inexpensive compared to other two. They need to be stored in a protected area as the UV rays can degrade the material. ABS is more durable and lighter in weight than polyethylene. Fiberglass and carbon fiber boats offer the best performance and are most expensive. Check out our reviews on the best kayak roof rack, which you will find our favorite 5 roof racks for your vehicles, and make you transport your kayak with ease. The kayaks are offered in a wide range of dimensions. They are also offered in different shapes. It is very important for you to choose the shape of the boat depending on the need and the purpose of the kayak. The hull shape is very detrimental in deciding the stability, maneuverability and the speed of the particular kayak. The hulls with flat bottoms are best suited for recreational purposes. The rounded hull kayaks are less stable than the V-shaped kayaks. But, they will offer you great speed while paddling and are ideal as touring kayaks. The V-shaped hulls are the fastest of the lot. They can be easily turned. The best tandem kayaks cost more comparing to single kayaks. You will find them to be available from a price range of $400 to $1500. It is important that you choose the correct one depending on your need and functionality. It is better to spend on models that are offered for $500 so that it comes to quality build and decent features. The beginners can invest in $500 boats. This is the lowest you can spend on a durable and decent features carry kayaks. They can offer you years of paddling and enjoyment. These boats might not be suitable for hauling a lot of camping gear and also might not have longer pedals. An average paddler who needs some storage space and decent seating and construction of the kayaks can invest in $750 tandem boat. These kayaks will have durable and efficient hull design with good seating solutions and leg room. They all have enough space to store your picnic and camping items. If you are an expert kayaker and love paddling, then investing in kayaks that are over thousand dollars is an ideal option. These will be full-length boats with sleek and sturdy construction and design. The best tandem touring kayak will come with all the features needed for the advanced kayakers. Apart from knowing the budget, it is also vital that you need to have an assessment about your ability levels. You should think about the purpose why you are going to buy the Kayak. A short kayak about 10 to 12 feet long is an ideal option for novice paddlers. They will be wise to offer better stability. An average kayaking enthusiast can invest in 12 to 14 foot boat. The experts in kayaking can invest in boats that are 14 to 16 feet long. These boats will have hull and keel designs. They are the best for strong paddlers and for pelican tandem kayak experts. The kayaking boats come with different specifications. The weight capacity, the length, depth, width rudders and skegs are the other factors to be considered while selecting the kayak. Weight capacity is the total load the boat can carry. Boats with more length offer better storage space. Though deep hulls offer better leg space they can become unstable in windy conditions. The width of the hull improves stability but narrow hulls help in faster movement. Rudders and Skegs help in moving straight, even during windy conditions. You can find a recreational kayak or the best fishing kayak for money or from reliable online stores. Go for kayaks with ergonomically designed seats and comfortable cockpit size. 1.Can 1 person use a 2 person kayak? Yes, 1 person can use 2 person kayak, but it will be more complicated and difficult to move it on the water and control it. 2.How much does a 2 person kayak weigh? Most of these models have a total weight of 60 pounds and they are 80% heavier than kayaks designed for a single user. A tandem kayak is a larger kayak designed for use of two people or tandem. Some of them are designed specifically for competitions. 4.Is a single or double kayak easier? A single kayak is lighter, smaller and easier to use. The weight is a massive difference and single kayaks are suitable for beginners. After going through all the tandem kayak reviews and the pros and cons of the different kayaks, it is clear for us that the Vibe Kayaks Skipjack 120T is the best 2 person kayak that meets both the need of a novice and experienced fishing enthusiasts. This is a highly recommended product for those looking to enjoy paddling with friends or partner and to explore the lakes, rivers or ponds. It can also accomodate up to 500 pounds of weight, perfect for a small family of 2 and a child. We rate this superb tandem kayak 5 out of 5 stars. It offers great fun and family time. There is no need to worry about balancing, paddling, and stability when using this kayak.